Describe your wedding memories in 5 words. We only need 2 words… simply perfect! We had our first date on Little Fistral Beach in Newquay, Cornwall and sat chatting for hours on a huge rock on the middle of the deserted beach. This is favourite beach in all of Cornwall so 5 years later we went for a summers walk on the same beach, he sat me down on the rock, looking out at the ocean and popped the question. I don’t remember much of it because I just cried happy tears! We only spent 5 months planning the wedding but I’m an Events Manager and used to be a wedding coordinator for 7 years so I had it all planned out ages ago! Our biggest challenge was planning a wedding in Somerset when we live in Cornwall. I wasn’t familiar with any of the suppliers which was tricky but St Audries was fantastic and gave us all the information we needed to make the process easier. The part of planning I enjoyed the most was making my flowers which were origami and I started making them as soon as we booked the wedding. I even managed to rope Shaun into helping me with folding, he enjoyed it and loved telling our guests that he helped. We received so many comments on our beautiful flowers. We researched suppliers mostly on Facebook, asking for recommendations which was really useful. I contacted some of the suppliers I know in Cornwall and asked them for recommendations as well and they were so helpful. It was a very emotional day for us, we’ve been together for more than 9 years and we’d waited for the day for a long time. My sister and I settled into St Audries dressing room and had a quiet moment together to take it all in. I could see Shaun arriving out of the window and got very emotional straight away (whilst also making sure he didn’t see me). It was very important to Shaun that I could relax and enjoy the day rather than going into ‘work mode’ and Sam at the venue made this really easy. She had everything sorted before I even had a chance to worry! So I was able to sit back and enjoy being pampered whilst enjoying my bubbly. I was so excited making my way down to the beautiful Orangery with the sun shining and everything felt perfect. Shaun didn’t want to see me until just the last moment but I was shedding a tear the moment I saw him standing and waiting for me. The registrar told him he could turn around and when he did I saw him smile and fight back the tears himself, it was beautiful and the moment we had waited for for years. We loved having all of our friends and family around us, the sun was shining and it was like a summer’s day! We had lots of photos and St Audries made sure Shaun and I had some quiet time to ourselves as well. We made our way through to the beautiful dining room for our wedding breakfast. We had our speeches at the start of the meal as the best man and Shaun were both really nervous about doing it. My dad’s speech was beautiful. Shaun’s speech was lovely and we gave gifts to our best man, chief bridesmaid and flower girl as well as flowers for the mums. The best man’s speech had us all laughing. They had nothing to be nervous about! Our wedding favours were miniature bottles of booze with personalised labels which went down a treat with our guests! It was very surreal having all of our loved ones in the same room and celebrating with us – we loved it. We wanted a very personal day, I’m very creative and love to add finishing touches to make everything really special. My dad made the doughnut wall and my sister (who designed and made our invites) painted it to match. We had personalised gifts for the wedding party, we had personalised socks for the groomsmen, slippers for the bridal party and me and Shaun had arranged small special gifts for each other for the wedding morning. Everything was exactly as we had pictured it. We were so happy with everything about the day, it was completely perfect and we have so many beautiful memories. To walk down the aisle, we selected Take My Hand by Emily Hacket – the lyrics are beautiful and very meaningful. 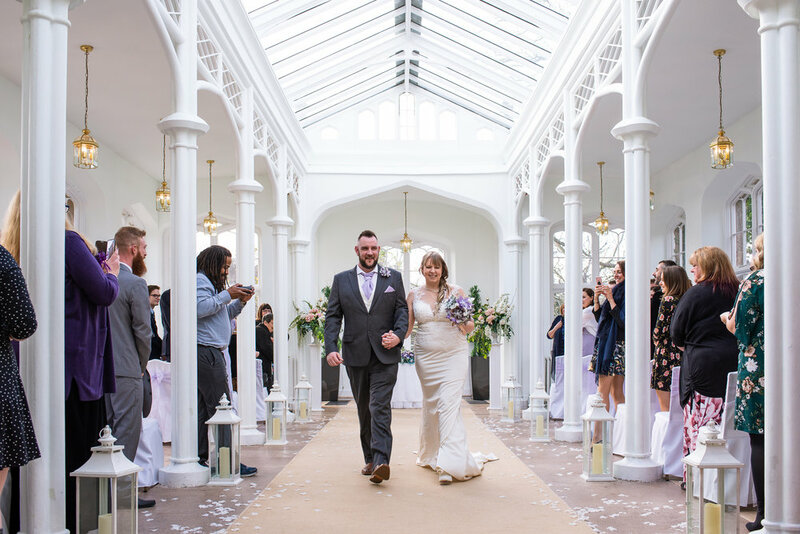 We love to have a bit of fun and wanted to make our guests laugh so at the end of the ceremony as we were leaving the Orangery, we played Fat Bottomed Girls by Queen – it got everyone laughing! We knew what we wanted for our first dance ever since we got engaged. We both love Mumford & Sons, especially There Will Be Time with Baaba Maal. Some of the lyrics are in Pulaar and when translated into English were very meaningful for us. We wanted our guests to be able to understand the lyrics so we translated it and the Best Man held up the lyrics ‘Love Actually’ style. Advice for couples planning their day. I don’t think there is anything that we would go back and change or do differently when planning. I would advise couples to add those personal touches to make it extra special. If you have the budget the high a Magic Mirror for the evening reception – this went down a treat with our guests and West Country Photobooths who provided it gave all of our guests copies of photos and added each photo into an album to give us at the end of the night – we had lots of fun looking at these the next day! Your favourite photo and why? 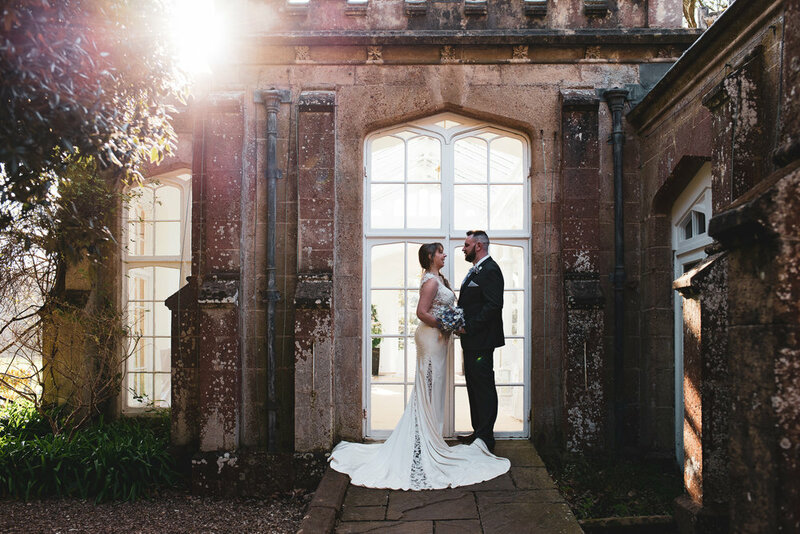 We haven’t seen all our photos yet but one of our favourites is us together outside the Orangery with the light coming over the top of the building. It shows off the detail of my full dress and we remember it being a lovely quiet moment to take everything in whilst our guests were nearby. I also love the photo of my dad seeing me in my dress for the first time. My dad and I are very close and I had dreamt of my dad walking me down the aisle for as long as I remember. It was a truly special moment. Bouquet/Flowers Made by the bride!